Have any (or even all) of your clients pigeonholed you? We become “pigeonholed” whenever a client labels us the person they go to for one thing but meanwhile, we offer many other things they’re buying from someone else. This can present a bit of a challenge for us because we don’t want to go over the top with the “Did you know we also offer ______” stuff. There are many things I do to keep the various things I offer front and center with my clients. Today, I want to focus on just one! First, I made up a single sheet with 10 services I offer. Note: I didn’t want the sheet to contain lots of words or narrative of any kind. Why? Because people are far too busy to read that stuff! It’s also very typical and I’m not typical. Next, I wasn’t digging the whole “10 Things I Do For My Clients” or “10 Ways I Can Work With You” thing . . . While speaking to something my clients need . . . 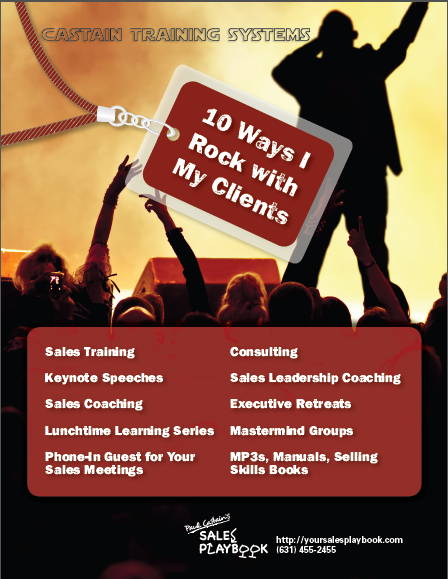 They need help becoming sales rock stars! So, I changed the title and went with . . .
“10 Ways I Rock With My Clients” Simple, elegant and no sh*tty marketing speak! I sent it off to my designers and let them work their magic. Here’s what they came up with . . .
It’s fun, its informative and its brief enough to get read. It’s also a versatile piece . . . I can send this to my clients in an email. I can include it as a page in my proposals. I can upload it onto my LinkedIn profile. I can send it off via snail mail with an intro letter or with a handwritten post it note. Do I think this crazy little PDF will change the world? Hell no . . . but I do believe it will help me in my efforts to educate while reinforcing my brand! I’m also of the belief that’s it’s a breath of fresh air because it ISN’T typical! The results have been incredible to say the least. For the last 6 years I’ve created more opportunity for additional products and services. Not bad a single sheet of paper with very few words! I have several other suggestions on how YOU can keep yourself from getting pigeonholed and will be sharing ALL of them during our How To GROW Your Existing Accounts webinar. How To Get The Inside Track On New Opportunities. A 3 Step Questioning Technique That Helps Safeguard Your Accounts, Generate MORE Business, Testimonials and Referrals. How To Get Access To Other Stakeholders Without Offending Your Contact. How To Expand To Other Divisions, Locations Etc. How To Add Value Via Ideas, Surprises and Resources. How To Create A “Keep In Touch” Plan Without Defaulting To “Calling To Check In”. A Meeting Format That Opens Your Client (and all the stakeholders) Up To New Ideas. 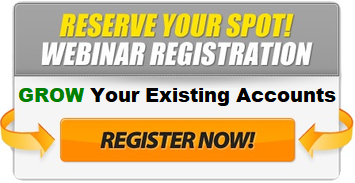 February 22nd at 11:30 am EST and if you can’t make it I’ll send you the webinar replay.